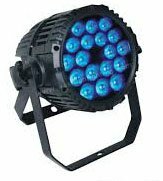 The Blizzard ToughPAR V12 offers superior color mixing abilities and brightness thanks to its 12x 15-watt, high power 5-in-1 RGBAW LEDs. Since each individual LED incorporates a red, green, blue, amber, and white chip behind a single lens, shadow artifacts and unevenness within the field are things of the past! And, like the other lights in our ToughPAR line, it also sports a durable cast aluminum with a tempered glass lens, watertight internal gaskets, and provides exceptional quality, and ease of use at a much lower price than other fixtures in its class.